cookies | Violet Makes Things. Makes a thick, chewy, 10″ cookie. In a stand mixer, cream together butter and sugars. Add egg and vanilla, mixing and scraping down the sides of the mixer. Add flour, baking soda, and salt – mix to combine. Add the chocolate chips and mix just until everything is neat and tidy together. Firmly press the dough into a 10″ cast iron skillet. I used coffee-flavoured chocolate chips – the local grocery store had them available just before Christmas, so I figured I’d try them. You can use whatever kind of chocolatey-chip-like thing you like best. Adapted from this recipe. You would think that I’d have taken a photo of this fudge, but I didn’t. So, close your eyes and picture a small square of yellow fudge. Honestly, this doesn’t look fancy AT ALL, but it’s pretty tasty. “Keep Stirring For The Love of..” Lemon Fudge. Makes an 8×8 tray. Cut ’em small! Spray an 8×8 square pan. Set it aside. In a large pot, over medium heat, combine the sugar with the evaporated milk. Stir it until it boils, turn the heat down a notch or two (keep it bubbling, just not as hot) and stir and stir and stir. Keep stirring for 6 minutes. Curse this entire process. After 6 minutes, turn off the heat and all the other ingredients – while stirring. I used my hand mixer for this part because I was really, really tired of stirring. Once the mixture is smooth and creamy, and the colour is right, pour it into the prepared pan. Smooth the top if you’re fancy like that. Set aside until the pan is cooled – then put the pan into the freezer for at least 20 minutes. This will make the fudge much easier to slice and remove from the pan. Slice the fudge small – this stuff is wildly creamy and sweet! These are so easy to make. At least, they’re easy if you own more than one mini muffin pan – which I thought I did, until I started baking. My husband ran out to get more. Around here, the mini peanut butter cups come in a resealable bag. I don’t understand why. Who’s going to seal that back up and walk away? Not me. I could not, for the life of me, get the chocolate to ‘drizzle’, so my husband used a knife and flung the chocolate on top. Worked perfectly. The cookies that I ‘drizzled’ just had blobs of chocolate on top – still tasty, not so pretty. Drizzling chocolate is not as easy as you’d think. Mix the flour, baking soda, and salt. Set ’em aside. Cream together butter and peanut butter, then add 1 cup of sugar. Beat until it’s delightfully fluffy. Add the egg and the vanilla. Mix a bit more. Add in flour mixture and.. yep, mix it up a bit more. Roll dough into 1 inch balls, then roll them in sugar. 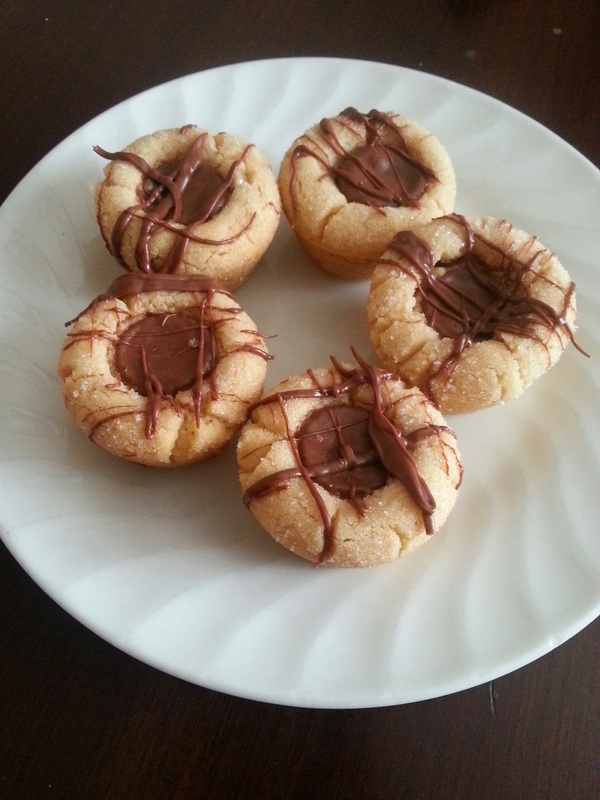 Put ’em in mini muffin pans and gently press a mini peanut butter cup into the centre of each ball.